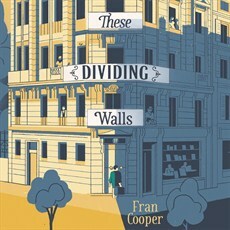 Fran Cooper’s debut novel, These Dividing Walls, is a meditation on the way ordinary lives are impacted by racism, Islamophobia, terror attacks and the far right in contemporary Paris. In a forgotten corner of Paris stands a building. Within its walls, people talk and kiss, laugh and cry; some are glad to sit alone, while others wish they did not. A woman with silver-blonde hair opens her bookshop downstairs, an old man feeds the sparrows on his windowsill, and a young mother wills the morning to hold itself at bay. Though each of their walls touches someone else’s, the neighbours they pass in the courtyard remain strangers. Into this courtyard arrives Edward. Still bearing the sweat of a channel crossing, he takes his place in an attic room to wait out his grief. These Dividing Walls takes the reader on a journey into the lives of the inhabitants of an apartment block in arrondissement Paris, drifting seamlessly from one character’s perspective to another. Meet among others, Edward and Frédérique, both stricken by grief; depressed and emaciated mother of three Anais and her absent husband Paul; Chantal and her lost and disillusioned husband César Vincent; Madame Marin, the gardienne who runs a hairdressing salon in the courtyard and slips out in the night; the hate ridden Isabelle Duval, and Josef, the vagrant who sleeps in the doorway opposite. Through this cast of quirky and troubled characters the various attitudes to be expected in any social mix, from tolerance through prejudice to extremism, are explored. The use of the present tense brings an immediacy to the story, focusing the mind of the reader on the characters in close proximity. Through it, Cooper, invites the reader to ponder the inane and banal aspects of prejudice. These Dividing Walls is a slow read that contains few surprises. The portrayal of terror and reprisal bleeds into the narrative, growing ever larger, vying for centre stage, seeking to oust the much larger and more poignant story of grief. Contemporary fiction is difficult to write, for the risk is always that themes appear stuck on, worked into something already in existence. Cooper manages to achieve a good balance, using the weather – Paris endures a June heat wave – to full and dramatic effect. Ultimately, it is the weather that binds this story and makes it work. I would like to thank NetGalley and Hodder and Stoughton for my review copy.